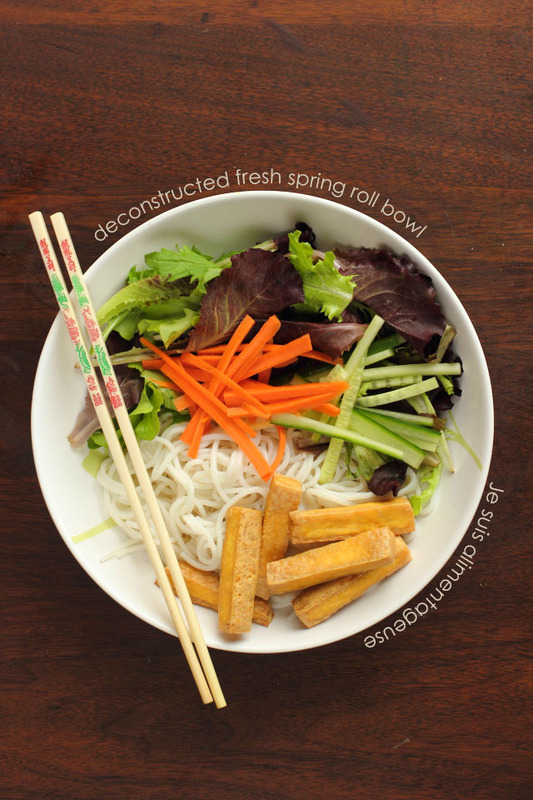 Deconstructed fresh spring roll bowl; a great and light lunch. 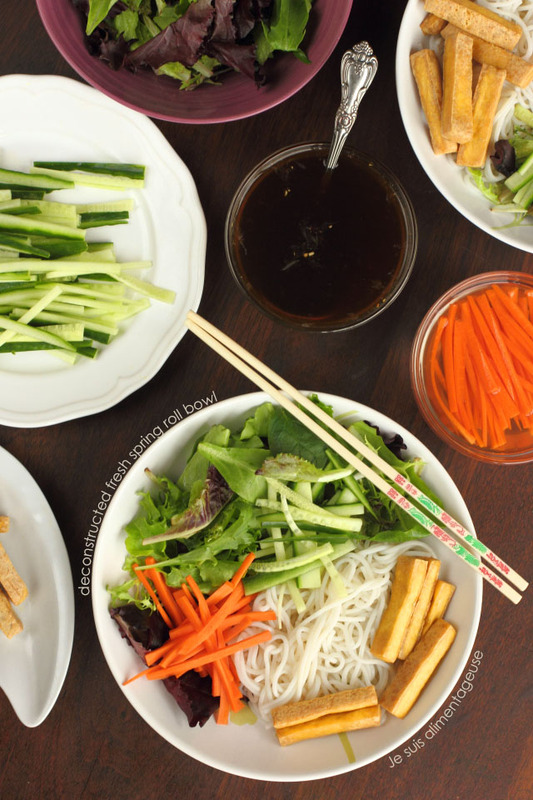 One of the best things about eating Viet food is that it’s often made with bright, simple flavours and fresh ingredients. Normally, these ingredients would be wrapped in a chewy rice wrap, but my newfound love for food in bowls (I know, it’s random) tugged my heart in the direction of foregoing the wraps and just eating it out of a bowl. Katie from Produce on Parade posted this stir fry a while ago with crispy baked tofu and I just had to give it a try. You can honestly top this bowl with whatever ingredients you’d normally wrap inside these bad boys. Or more. YOU DO YOU. In other news,Â I handed in my last paper of my Master’s on Thursday and I feel a certain sense of unease and relief at the same time. I’ve been in university straight out of high school and now I’m done. I did a BA in Translation and an MA in Translation Studies. I feel hollow and bloated at the same time. I’m supposed to be “ready for the real world” now. After 4 years of practical training in the Translation industry and 2 years of critical thinking about the field itself, I am supposed to be ready for the world. Only, it wasn’t until halfway through my MA that I realized that I loved languages, but I loved this more. I love food photography. I love website building. I love food writing. So what now? Where do I go from here? I’ve been working for an experiential marketing company for a while and I really like the work I’ve been doing with them, but I know that’s not long term. They want young, beautiful people who are confident and can convince people to try whatever product we’re promoting. And I can’t be that forever. But right now, as weird as it is to say it, that’s me. My goals from the first Happy and Healthy post of 2014 were to set aside my insecurities about my skin, my face, and my body and just own it. Be me. Believe that I am beautiful. Know that I am beautiful. My goals last week were to avoid processed and canned foods, and in the heat of paper writing I had the overwhelming cravings for crispy snacks and my vice: Oreos. I have no idea why Oreos have such a magnetic pull to my tastebuds. But I stuck to my guns: no delivery Indian food, no chips, and NO OREOS. I opted for medjool dates, homemade spiced lentils, and some of these to satisfy my cravings. Success! To make the pickled carrots, whisk vinegar and sugar in a small pot until dissolved. Pour over sliced carrots and quick pickle for either 15 minutes, but best if done overnight. Preheat oven to 400F, and slice pressed tofu into strips. Spread onto a lined baking sheet, ensuring that none of them touch. Bake for 30 minutes, turning occasionally for even browning. Remove from oven and let cool. 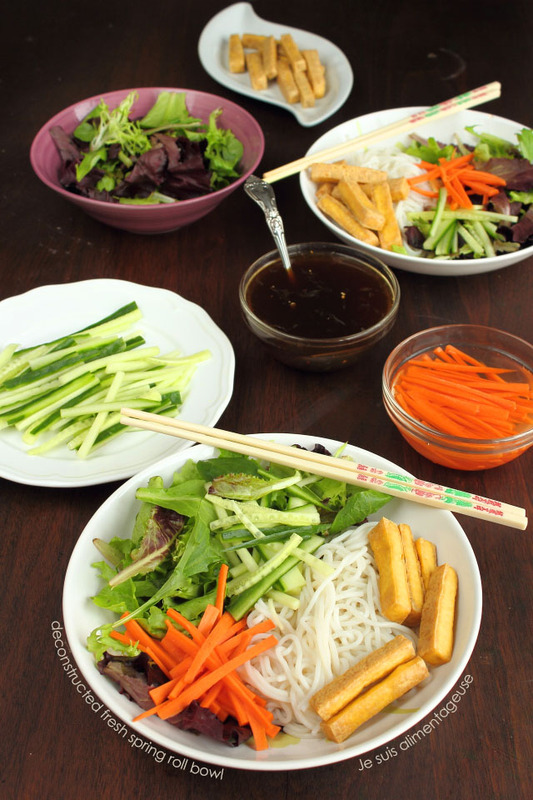 To assemble the bowl, layer noodles, tofu, spring mix, cucumber, and quick-pickled carrots in a bowl. If you have other greens like thai mint, or chives, add those too! Serve with vegetarian dipping sauce as dressing. Enjoy! Thanks Becky! I love the crispy flavour, but you really need to soak it in some sauce afterwards otherwise it'll taste pretty bland. I came across your blog while searching for vegan cream cheese frosting recepies. Your blog is absolutely amazing! I can't wait to try out your recepies, especially the Vietnamese ones! My spring rolls tend to fall apart or are too tacky, this bowl would be a nice change.